We are not related to a long line of playwrights, artists, politicians and murderers. Most of our lot were opticians. But we’re quietly proud to have in our family tree a famous pair of music hall entertainers from the period between the end of the 19th century and WW1. 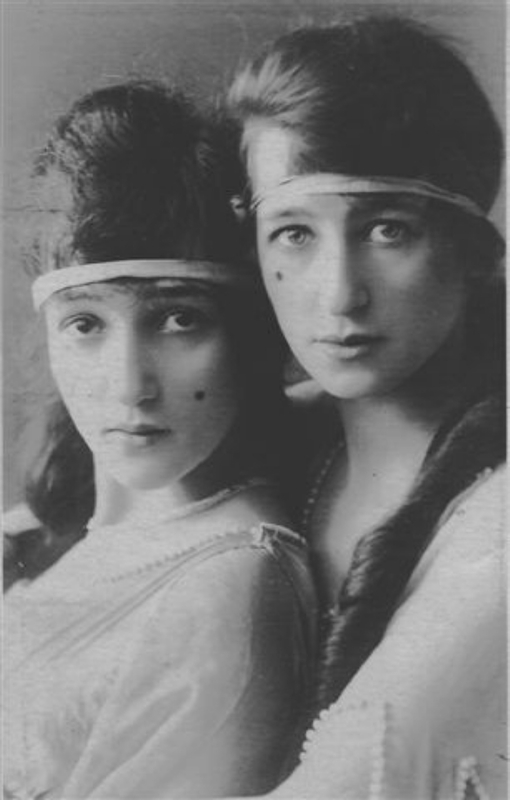 ‘Beatie & Babs’ was the stage name of two sisters, Bertha Beatrice and Hilda Diana Samuels. Their mother was Emily (or Emelia), the daughter of Victor and Mathilde. Bertha was born in Dublin (we don’t know what they were doing in Ireland, Emily having been born in Liverpool) in 1893 and her sister Hilda came along in 1897 after the family had moved to Rhyl in north Wales. The girls started young. They entertained at school shows, charity events and private functions where they were spotted by an impresario. In 1908 they appeared at the Tivoli in Manchester performing a review written by their Uncle Arthur. The piece became the subject of later litigation over royalties. Following their success at the Tivoli, the girls were engaged to perform their song, dance and comedy routines at music halls throughout the UK. Next they undertook a 3 months’ engagement at the Folies Bergeres in Paris, as well as making appearances in Brussels, Munich, Vienna and various other European cities. By 1911, the family had decamped to the bright lights of London. Beatie & Babs featured at the Pavilion (8th May 1911), and went on to Dublin, Glasgow and many provincial theatres. In 1912 they were in the USA where they performed at the Colonial Theatre in New York (unfortunately to polite yet tepid reviews). But they were back again in 1912 at Broadway’s Hammerstein Victoria Theatre, so they couldn’t have been too bad. On 1st July 1912, the girls performed at the first ever Royal Command Performance in front of King George V. Others on the bill included Vesta Tilley, Pavlova, George Robey and Harry Lauder – an illustrious line-up. They continued performing throughout the First World War and into the aftermath. In 1921, for example, they were appearing at the Argyll Theatre in Birkenhead and in 1922 they were ‘twice daily’ at the Coliseum, Charing Cross Road, London. They appear to have abandoned the greasepaint for wedded bliss. In 1922, Hilda (Babs) married Herbert Henley, founder of the motorcar dynasty. The same year, Bertha (Beatie) married William Tickler, a member of the famous Tickler Jams family. However, in 1923 a report in The Times suggested the duo were planning to make a comeback appearance at the Coliseum in London. That’s the last report we have of their stage career. The British Film Institute has archived a newsreel produced by Topical Budget Company of Bertha and William’s marriage ceremony. However, access is forbidden on conservation grounds and the BFI refuses to allow us to view it. No doubt the directors of the institute can explain the point of keeping the clip then, especially in this digital age. In 1939, Bertha applied for a patent for a new style of manicure and pedicure equipment. Bertha died in Bournemouth in 1952. Hilda died in 1990. We have more on Beatie & Babs, but most of our information has been uncovered by stumbling over news reports or articles on line. If you have something, please email: contactus@kahngene.org.uk. I thought I would drop a line. I was really interested to read about Beatty and Babs because my mum, Nadia, was the only daughter of Bertie Henly and Babs and I am Babs’ only grandchild. Do get in touch – it would be fun to exchange information and get to know some long lost relatives. Hello Amanda – thanks for getting in touch and great to hear from you. Beatie & Babs were my father’s cousins. We are slowly finding more information about the pair. I’ll happily send you what we have if you’d like to let me know your e-mail address – send it to contactus@kahngene.org.uk. P.S. I sort of wish I was a Kahn when I read this! Thankyou for contacting me, even though it was back in November 2013. My apologies as I had not logged on for a long time, and was very pleasantly surprised by your input. Amazing to know there is someone living in England that is connected to great grandad. I wished I had posted this around late 2010 as my husband and I were on a 5 week holiday in England and Ireland. We could have met over coffee…….? !I had all the addresses that great grandad had lived in and planned to look at each of them, but time ran out and we had to fly home. Yes there are quite a few relatives over here, as in Perth and Adelaide. I have a cousin who has really researched great grandad and his life in depth. Would you be interested in her help? Firstly, I would have to make sure if she is happy to do this.I think she would jump at the chance personally! I would love to see a copy of Torrens house if you can possibly do this. It would be so appreciated. Yes I think you are right that the family did own the property after his death. One of his last living grand daughters tells the story that he planned to go to the Canary Islands for a holiday and told his housekeeeper that he “would not come back”!! Consequently he fell out of his bunk on the ship and broke has hip (I think) and died and is buried Los Palmas. I have tried to find the grave by surfing but not with success. Thankyou very much for your reply,that was very nice of you to take the time to do so. Yes I agree if we can get a photo of Torrens House it would be marvellous, so am keeping my fingers crossed that Elissa does reply and can locate a photo. Of course if she is happy to do so, I am sure a copy could be donated to your organisation. I didn’t think that great grandad would be connected to the Ticklers but the part that got my attention in the first place, was that their address was Torrens House. Great grandad, I think, he owned it and later on lent it out to recovering War Veterans. He had several houses in Ealing and a laboratory (he was a inventor and scientist) I believe. We finally do have a picture of Torrens House – or at least some of it. We now have a 1930 photo of Beatie standing in front of the house. This was passed on to me by her granddaughter Penny. Thank you so very much for sending tho photo of Torrens House!!!!!! My it does look like an impressive building. I have sent it on to one of my cousins who is writing a book about captain Angel. Her mother is the last of Captain Angel’s grandchildren ( from this side of the world!) and she turned 94 years old yesterday. My cousin is trying to finish it before she is no longer here……. I have not heard from Elissa so far but will keep checking the site from time to time. Thank you again for taking the time and trouble of sending the photo so that after all of these years we can see what it used to look like. I do hope someone is still looking on this site in regard to Captain Angel Sr. I am responsible for the British Cemetery in Las Palmas and was researching for a small book on some of the interesting people who are buried there and yes, we have the grave of Capt Henry Robert Angel of the famous clipper “Torrens” (the even more famous writer Joseph Conrad sailed as an officer on her with Henry) of which I can copy a photo to anyone interested. A Frank Angel was also buried in this cemetery two years later in 1925. Were they related, I wonder? What a fabulous surprise to find your email this morning. You have made my day! my great grand father. I looked at the date that I posted my last message and amazingly it was in 2012.
any photos of it, as we (the family) would love to see his final resting place. this email to her for her opinion, as she is a real whiz at research and writing. Museum, used to be housed in the Greenwich Maritime Museum. Where are you located Betty? I live in Perth Western Australia. PS. I am pretty sure that Frank Angel is not a relative of ours. I can certainly get a photo for you when I get back home to the Canary Islands. I’ve just arrived in England today for three weeks so it won’t be till mid-March. A local journalist visited the cemetery only a week ago with a group of adults, students of English and when I told him what I knew about your great-grandfather he was inspired to write an article about him in the weekend paper. In fact our cemetery holds a number of very interesting people and is visited by school groups and adults who want to know a bit more about the British who called at the port of Las Palmas on their way to or from West and South Africa, India or, indeed, Australia, some of whom eventually made their home on the island and, as it was an important port on the old trading routes, set up import/export businesses, introduced improvements in agriculture, built a port, ship repair yards,bunkering, banks, and brought telephones, telegraph and even water to taps at the end of the 19th century. Your great-grandfather would most likely have been aware of all this and would doubtless have called at the port many times before the accident that ended his life.